Casio Exilim Z850 - My new Casio (2006), a replacement for my 3000EX which was getting a bit long in the tooth, but has served faithfully for the majority of photographs in my Travel section. I chose the 850 (8.1mpx) despite the release new EX1000 (10.1mpx) as firstly, it has an optical viewfinder (the 1000 doesn't) as well as the big bright Lcd. Secondly, as a result of the new model the price of the 850 dropped by £100 (now at £140) which was too hard to resist. 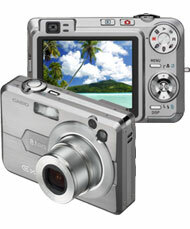 What a great little camera this is, its compact size means it will always be in my pocket from now on. The EX-Z850 offers a high quality 8.1 megapixels photos which includes a 3X optical zoom, and offers both manual aperture and shutter speed priority AE options for advanced users who prefer to create customized images. The impressive 2.5” Super Bright LCD generates approximately 1,200cd/m2 of luminescent output, making the monitor even easier to view when outdoors. EX-Z850 incorporates the eBay Best Shot which allows the user to take photos at a size that is image optimized for display on eBay, allowing picture takers to more quickly and easily create photos for selling items on eBay. eBay Best Shot mode also includes Auto Macro, an ideal setting for capturing images of small items such as jewellery, tags, etc., thus automatically adjusting the focus from acquiring fine details in close up shots to capturing large items from a distance. eBay Best Shot mode allows users to capture optimized images at an ideal size for eBay. The EX-Z850 includes the latest version of the EXILIM Engine, featuring the Anti Shake DSP, which considerably reduces the capture of blurred images due to shaky hands or moving subjects, so you only have to worry about which shots to take, not how they will come out. In response to user’s high demand, the EX-Z850’s Super Life Battery supports 440 shots per charge, providing convenient, long-lasting usability. Notably new features on the EX-Z850 include flash functions for a variety of settings and situations, including Rapid Flash, which enables three flash photos in only one second to completely capture a given moment; Soft Flash, which prevents overexposure of subjects photographed up close; and High Power Flash, which ensures that subjects are properly illuminated even when photographed as far away as approximately 39.7 feet. The EX-Z850 also includes “Old Photo” Best Shot Mode, which refreshes faded colours of old photos by bringing them back to life in digital format. Additionally, when taking high quality long duration MPEG-4 movies, the EX-Z850 instantaneously reduces camera shake electronically. For movies taken in dimly lit environments, the “built-in” Illumination LED Light provides additional illumination of the subject. 16 sec. Approx. 8 min. 21 sec. 31 sec. Approx. 15 min. 52 sec. 320 x 240 (LP) Approx. 745 KB/sec. (15 frames/sec.) Approx. 1 min. 27 sec. Approx. 44 min. 17 sec.